Why are pills so strong at the moment? 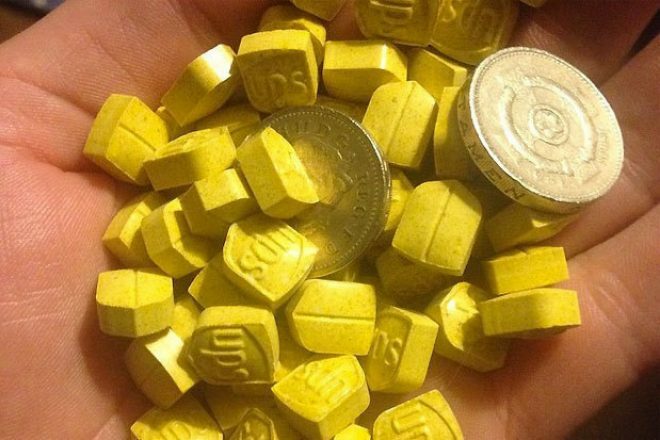 A batch of super-strong pills pressed in the shape of the UPS logo are currently in circulation in the UK. They're so strong that they made headlines this weekend: once on Saturday after users were warned about their potency and once on Sunday, when it was reported that a group of ravers had been taken to hospital after taking them. Some recent batches of 'ecstasy' pills have been dangerous because they contain toxic ingredients, such as PMMA, and are sold by dodgy dealers as the real thing. But the UPS pills may be potentially harmful because they are so strong. Some UPS pills have been found containing up to 278mg of MDMA – that's over a quarter of a gram – or three or four times more powerful than a standard-issue UK pill (see here for reports from users). So why are such strong pills in circulation? Well, our sources say that the crew making these is based in the Netherlands and are the people responsible for creating some of the strongest pills to be found in recent years. 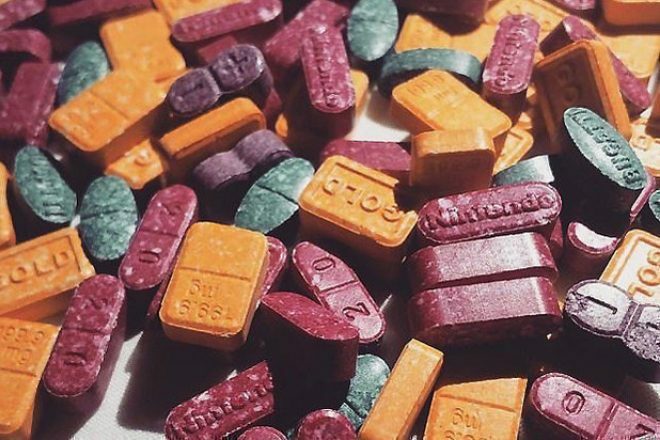 Known as the Partyflock or Q-dance crew, other pills in their portfolio include the Q-Dance, Defqon, Speakers, Ferraris, Partyflock, Android, Tri-Force, and more recently Heinekens and Gold Bars. The next pill in the series will apparently be Red UPS (all that means is some new food colouring in the mix). Partyflock is a social network that is relatively unknown outside of the Netherlands, and Q-Dance is a Dutch producer of music festivals both in NL and abroad. There is no connection between these legitimate organisations and the pressers of these pills, who have hijacked these brand logos. This crew takes pride in producing premium, hard-to-fake pills in new shapes and sizes and colours, usually containing extremely large doses of very pure MDMA. Dutch users who know the 'brand' tend to use just quarters or halves initially. The '£10 mega pill' has been doing the rounds for a good few summers now but the tablets that are now being produced are super-strong because there is more MDMA around in the EU at the moment than there has been for years. Prices are also dropping lower than ever, with grams available at retail level for £25-£40 and ounce prices dropping below £500. Looking further up the supply chain, kilogrammes are cheaper than they have been in years, at around £8,000, and there is a glut of the drug all across Europe. That's because of precursor innovation – new ways to make MDMA have been found, as one ecstasy chemist who worked in a Dutch lab told me. Dutch chemists have found a new recipe – they are using a chemical called PMK-Glycidate, which is legal, rather than PMK, which is banned, as the main ingredient. That has translated into higher-dosed, purer pills all across the EU. Pills of this quality are sold at higher prices than lower-dosed counterparts, and the Dutch team making them know that by making stronger pills than anyone else, they stay ahead of the competition. They release eye-catching pills in never-before seen shapes and sizes, with huge doses of MDMA, and corner the market for a few weeks – at which point copies arrive and the team release a new, novel shape and colour. But beware, these counterfeit pills will be from a different manufacturer and will vary in quality. But pills of this extreme quality tend not to reach the United Kingdom, not straight away, and not in bulk, and certainly not to smaller towns like Middlesborough. So what else has changed? The clue is in the logo: United Parcel Service. It's a cheeky nod at the fact that many dealers using dark web markets, and posting packages of thousands of these pills all across Europe. Alongside normal smuggling routes, by road and sea, these pills are being imported into the UK from Holland and then resold on the dark web. They have also shown up in the US. Yellow and hard in consistency, with a distinct, outpress logo, rather than an impression, the pills are exceptionally well-produced, with a glaze-like sheen that seals the drugs and protects them from crumbling, a professional touch few other crews bother with. Rather than being a standard round tablet with a logo, they are shaped like a shield, with a deep breakline across the back. It's there for a reason – if you have these pills, do them in halves, or quarters. They are hard-pressed, and some users say they take a long time to come up, as the pill takes a while to dissolve in your stomach. So do not redose, thinking they aren't working. Wait at least 1.5 hours before redosing, longer if you have a full stomach. And in the meantime, while these Dutch imports are landing on these shores, any time you take any pill that looks really well-made or is unusually shaped, start low and go slow.